Logline: Lawyer from New York Alex happens to get evidence of the conspiracy between the world government and powerful alien civilization, which is about to destroy the Earth, they only need to reach an ancient artifact — sphere of consciousness of the Earth that protects the life of the planet. While escaping from the pursuit by security services and aliens, Alex gains a superpower in caves of the Egyptian pyramids. Alex learns how to use the unlimited capabilities of his mind to protect the Earth from the aliens who want to flood the whole planet. However, even that cannot stop the apocalypses, only the collective will of people multiplied by selfless love of Alex and Alice can stop the catastrophe. 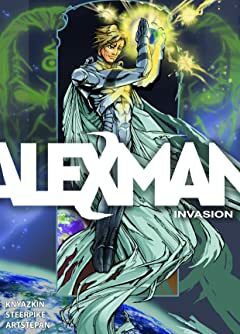 ALEXMAN first superhero in the history of mankind, who will teach every person on Earth how to get superpowers!